This app is aimed at helping children practise their fractions, from the simpler starting blocks of halves and quarters through thirds and eighths up to fifths, sevenths and more unusual fractions.There are 4 mini games featured, each one aimed at helping with a particular skill involving fractions and featuring between 2 and 3 difficulty levels per game. 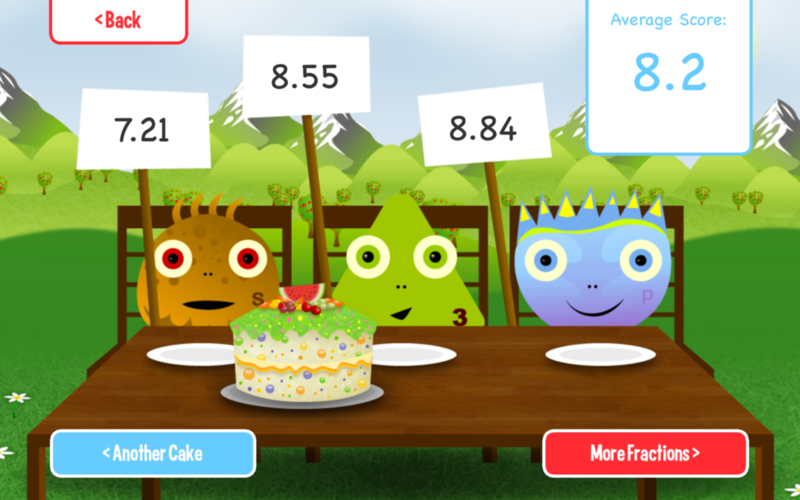 A Piece of Cake: this game involves selecting the right number of segments from a cake to make up the fraction the Squeeble asks you for. With 4 Squeebles calling out different fractions, you have to be on your toes to give each of them what they want. This teaches visual recognition of different fractions as a part of the whole. Tricky Pairs: in this game you have to match pairs of fractions that are equal, so 1/2 would match with 4/8 for example. This helps children recognise equal fractions with different denominators and sets them up for understanding the concept of reducing fractions to their simplest form. 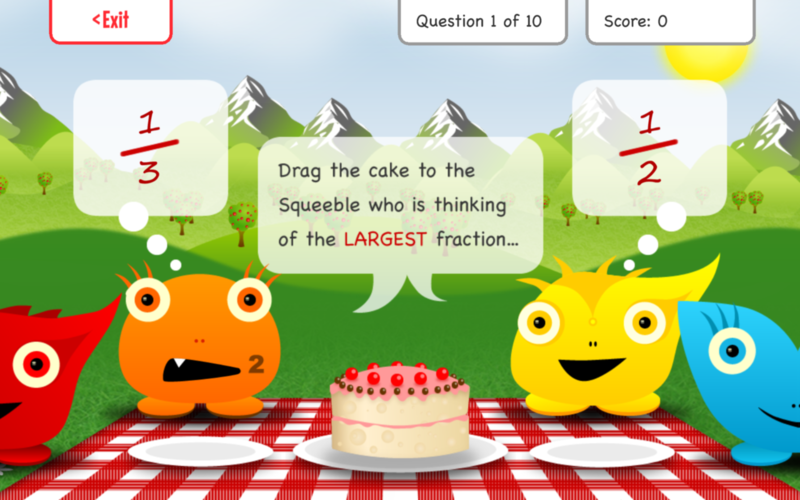 Think Big: this game asks you to drag the cake to the Squeeble who calls out the largest fraction. This helps children to learn comparison of fractions and recognising quickly which fraction is largest out of 2 options. The reward for doing well in these games is that you win cake ingredients (from a list of over 100) to use to make weird and wonderful virtual cakes for entry into the Squeebles Cake Show. You also earn entries into the show, so a child can't just keep playing with the cake-making part of the app without having to work on the educational part to earn their fun! The cakes you make are judged by a panel of 3 Squeebles (different each time from a selection of 5 available characters) with marks awarded out of 10. Different judges like different things and Squeebles love weird flavours so don't be surprised to see a potato curry and spinach cake with sugar mice and spicy peppers scoring well!!! 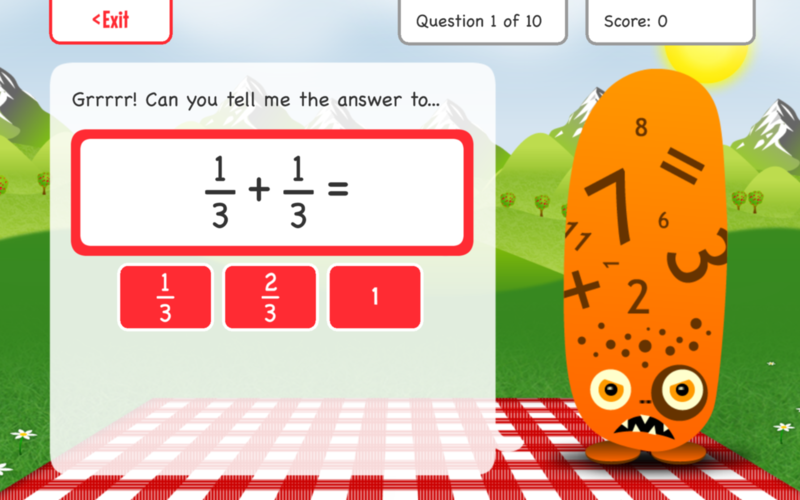 The Squeebles maths aps are really simple to use and are a great help to my 8 year old. We mainly use the times tables, but are starting to use the fractions ones now. Great way of making maths fun and it has really encouraged my son to take time to try fractions without having to be asked ! Perfect!! My grandson loves this game. Plenty of 'rewards' to enable the player to make weird and wonderful cakes. The games are timed, he love beating his times. His confidence with fractions is improving every time he plays. A wonderfully effective method of demonstrating the concept of fractions. 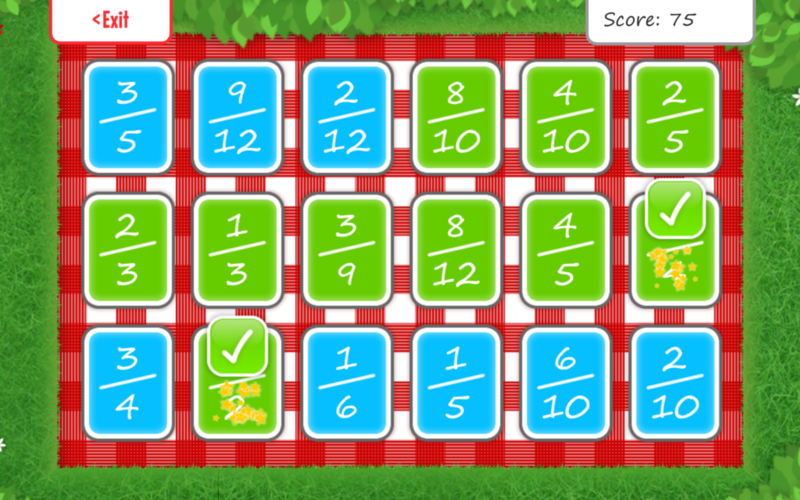 This is another fantastic maths app from the squeebles family. There are four different fun fractions based games, with different levels of difficulty to help your children practice their fractions. 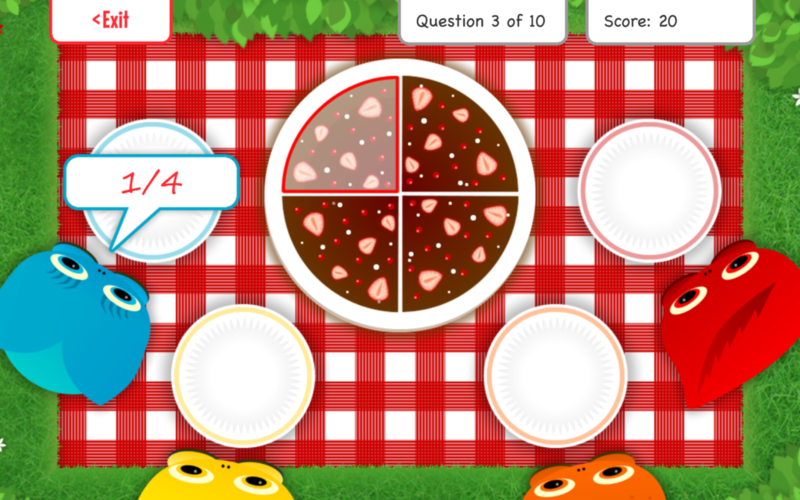 As with the other squeebles apps, the children get rewards for completing their fractions - this time based around winning ingredients, fillings and toppings to make cakes for entry into the squeebles' cake contest. It is this fun reward element which makes the app so great. My children are very happy to practice their fractions; as well as making the process itself fun with the game based approach, the children love making the cakes afterwards - the more disgusting the better in their eyes! My son is in Key Stage two and has really had so much fun doing this and he has learnt a lot which has in turn helped with his understanding. The way its set up is easy and colourful and he loves getting them right. The Squeebles games have proved to be hugely popular and very effective learning tools for my 8 year old. She enjoys playing them and her maths confidence has greatly improved over the last few months. Highly recommended! When my son saaw that I'd downloaded a maths app to his Kindle he was not impressed. However, after watching his sister play Squeebles maths games on her device, and become totally absorbed, he decided to give it a go for himself. This app is perfect at making fractions understandable. The cake game where you have to work out how much cake is being requested is just brilliant. It brings maths to life for children and really helps them get a grip on the problem. I would recommend this to anyone looking to help boost their child's grasp of maths. I Would highly recommend all Squeebles apps. They are easy to use and encourage children to enhance their numeracy skills.